I wrote a review about One Canada Square in 2015 where I attributed a dining experience to a poor night in the kitchen. Since then we have had many excellent meals at One Canada Square – until a couple of evenings ago when it came to a crashing halt. I find it difficult to write negatively about a restaurant as Blogs and restaurant reviews are widely read and have impacts, but I cannot let this one pass. I should note at the beginning of this review that their very talented Head Chef Raphael Liuth WAS NOT working on this evening, presumably the kitchen was in the hands of his Sous Chef or some other deputy. Our evening was to celebrate the 60th birthday of a dear friend, so spirits were high. I suppose a slight annoyance set in when on ordering a couple of pints of beer, we were served “pints” with a head taking one third of the glass – at £5.90 a pint. To be fair the glasses were filled when I requested them to be so, but I noticed this was a common occurrence across the bar! Each dish very enjoyable in their own right. The Steak Tartare has a nice mix of steak and “pickly things” (cornichons and capers) and spice and the raw egg yolk makes for a rich, unctuous mouthful. The Tuna Tartare is a light and refreshing bite and the Yeorkshire Fettle and Wheat Grain salad tasted, I am assured, very healthy. On to the mains. My wife chose the Pea and Mint Raviloi (£16.50) with aged parmesan and broad beans, Birthday Boy went for the Roast Herdwick lamb rump, spelt, spring onion and minted jus (£24.00) and I plumped for the 350g Sirloin Steak, served on the bone (£32). Our sides were Steamed Greens and Steamed Spinach at £4.00 each. On the plates, it all looked delicious. Now, those of you who have followed my blog know I rant about steak knives as it always makes me wonder what is coming. The steak knife I was provided with was, if anything, less sharp than my regular knife, so I asked for that back and duly attacked my steak. And I attacked it, and attacked it, eventually separating it from the bone – it was no easy task! Before proceeding I thought, discretion might be the better part of valour and I called for a sharp steak knife. This made cutting the steak a little easier – it was cooked medium rare as I ordered, it tasted nice…. but I only wish I had sharpened my teeth while asking for a sharper knife. The steak was tough – really tough! And it was such a shame as it was a lovely looking piece of meat. For a restaurant that is trying to change itself into an upmarket steak house, this should be a concern. Now to be fair, our young waiter, Akhmal, handled this brilliantly – removing the offending dish and offering me an alternative. As my dining partners had almost finished their meals, I asked for a piece of fish which can be quickly cooked – and out came their Hampshire trout, sauteed gnocchi, sprouting broccoli, wild garlic pesto. Overcooked and dry….. another disappointment! Birthday Boy reported that his lamb rump was very nice and tasty so that was good. And then we came to my lovely Kate’s ravioli. It’s really difficult to know where to start wth this. The ravioli was served on top of a sauce that we all felt was nothing more than a smear of cream cheese – bland and claggy. The ravioli was bizarre – I ate one and it burst against the roof of my mouth as if I had a little pouch of a pastey glue with a rather unpleasant aftertaste. Coffee (£3.50) and Petits Fours closed out our meal. It was at this stage that the Manager of the restaurant appeared table side to express his “concern” about issues we had encountered and reassured me that neither of the main courses I had been served were on the bill. And indeed it was reassuring as I didn’t eat either of them! We had washed our food down with a pleasant bottle of Pinot Grigio (£22.50) and a light French Pinot Noir (£28.50). When the bill came, there was an error – two pints of froth, sorry, beer had been missed off so I pointed this out to our waiter. He took it up with the Manager who promptly added the beers back on to bring our bill to the grand total of £180.11 Now, I never expect to be comp’ed anything, but I would have thought that with the problems with our meal and THEIR error on the bill, the Manager might have just waived the missing beers as a gesture of good will. But no, he chose not to which confirmed our collective doubts around the table about the sincerity of his concerns. Now, I wish it ended there, but regretfully not. 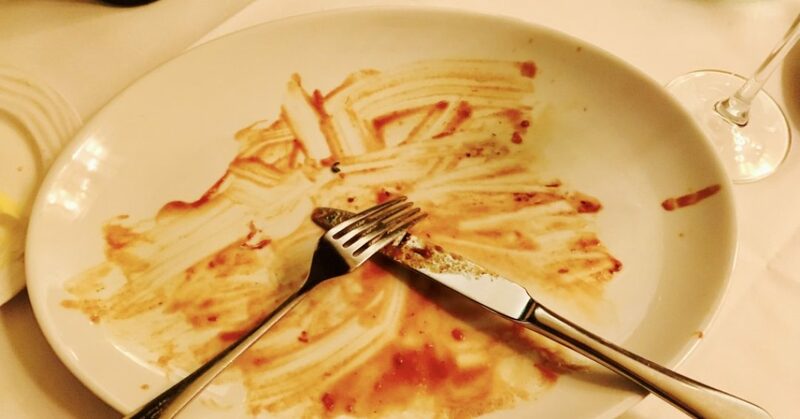 Both my wife and I were ill during the night and the following day – the only thing we could put that down to was the Ravioli. I would close this difficult review with this comment. Every restaurant can have an off day – even the best in the world and it really comes down to how the restaurant and its owners deals with the situation. I have already had a lengthy conversation with the owners of One Canada Square who have taken on-board my comments and observations. From past experience, I am confident that they will address the issues with rigour. I hope for their sake that they do so. Previous: Previous post: Chef Profile: ARTURO GRANATO Executive Chef, Avista Restaurant, Grosvenor Square, London.